Karina's Kreations: For All Do Spring Card! For All Do Spring Card! I love the colors of this card. The soft pastels remind me of spring. This is the first time I've played with my Stampin' Up stamp set called For All You Do. It's got a lot of great images to play with. 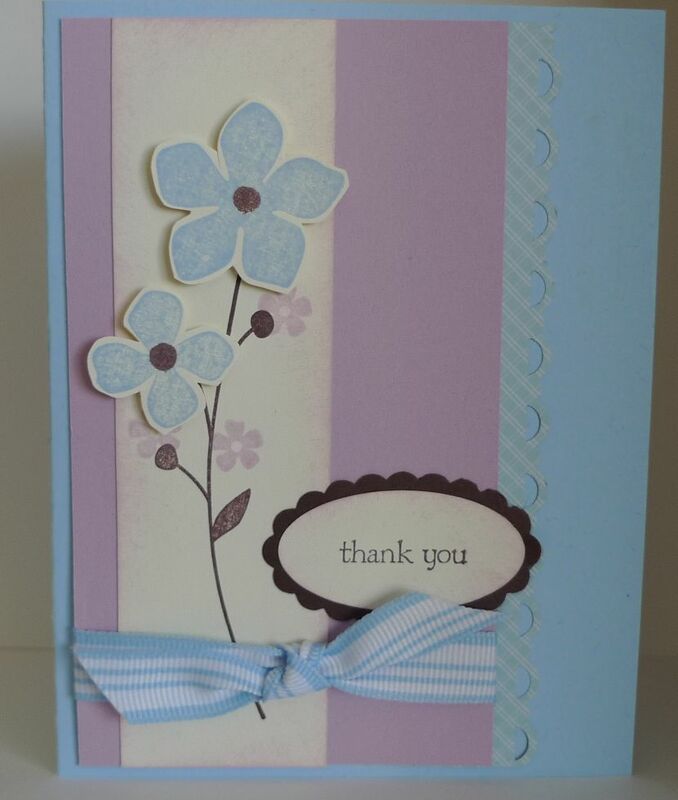 This card uses Bashful Blue, Pale Plum, Very Vanilla, Chocolate Chip and Sweet Pea Designer Series Paper. The designer series paper is punched with the Scallop Trim Border punch and tucked behind the Pale Plum layer. The branch was stamped with Chocolate Chip ink on Very Vanilla Card stock. Pale Plum flowers were added. Two different flowers were stamped with Bashful Blue ink on very Vanilla card stock and cut out and attached to the card with Stampin' Dimensionals. The center of the flowers were made with a pencil eraser and Chocolate Chip ink. Dip the eraser side of the pencil in the ink and stamp on your flower. Rub the eraser on scrap paper to remove the ink. Bashful Blue 1/2" Striped Grosgrain Ribbon was tied around the Pale Plum layer. The greeting was stamped in Chocolate Chip ink on Very Vanilla card stock and punched out with the large Oval punch. The greeting was layered on Choclate Chip cardstock that was punched out with the Scallop Oval punch.